Apple 'iSlate' Trademark and What is a 'Magic Slate'? After we broke the news yesterday that Apple had acquired iSlate.com, other pieces to the puzzle seemed to fall into place. Notably, TechCrunch found that iSlate had been registered as a trademark by an unknown Delaware company by the name of Slate Computing, LLC in November 2006. iSlate had also been registered as a trademark in Europe using a law firm that Apple employs. The implication being that Apple set up Slate Computing, LLC as a dummy corporation to secretly acquire the iSlate trademark. Apple has been known to do this in the past. For example, the iPhone trademark was originally filed by Ocean Telecom Services, another anonymous Delaware-based company. Regina Porter happens to also be Apple's Senior Trademark Specialist as shown in her Linkedin profile. While we can't definitely pinpoint this to be the exact same Regina Porter, it seems beyond the realm of coincidence. So, not only did Apple obtain the iSlate.com domain in late 2006/early 2007, it also seems likely that Apple also filed for an iSlate trademark under a dummy corporation. Given that, it seems "iSlate" is very likely going to be the name of the upcoming Apple tablet. Another interesting tidbit, as first noted by Fscklog, iSlate is not the only trademark that Slate Computing, LLC has filed for in the United States. The company also filed for a trademark for "Magic Slate". The term was categorized broadly to cover Computers, computer peripherals, computer hardware and much more. "Magic Slate" adopts a similar naming convention to the recently released multi-touch Magic Mouse from Apple. 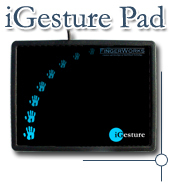 It's not hard to imagine that a "Magic Slate" would be a multi-touch peripheral for computers, much like the multi-touch iGesture Pad released by Fingerworks before their acquisition by Apple. Exactly such a multi-touch "trackpad gadget" was rumored in October. It's not clear if Apple is still planning on releasing such a device, but the name of "Magic Slate" would fit in nicely alongside the Magic Mouse.